"Into the Darkness" is the true story of a young Australian thown into the crucible of the air war over Europe. Navigator, Arthur Hoyle, discovers the excitement, the comraderie and the fear of being part of Bomber Command. 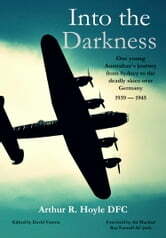 Intelligently written this book dramatically recreates the the trials of air crews over the dark skies of Europe — where the chance of surviving the full ‘tour’ was very low. Close to half of all Bomber Command crew who took off into the darkness never returned. Displays the heroic actions and self sacrifice made by these people to ensure all our freedom. Very well written, holds your attention throughout, a very good and informative read, recommended reading for WW2 buffs. I liked that it was not fiction and the author had actually lived these events. There was enough excitement to keep me reading. An interesting book that was spoilt by a huge number of typos, e.g. 'perdition', (I think they mean 'permission'). There are many others, too numerous to list here. It took me three attempts to give it two stars - it kept wanting to award three, no chance! I lost count of the number times I 'tapped' for other edits, usually to no avail.